There are so many spots for clutter to hide in your bathroom. Especially if you're sharing your bath space with another family member. The supplies can really add up. Some of us keep our supplies strewn all over the top of the counter while others are a little more diligent about putting away items. Here's a great way to keep supplies tidy but yet still easily available and at your fingertips. There are spots for some wide mouth mason jars to hold items such as cotton balls, toothbrushes, and q tips. In our home, toothbrushes are the must have items we keep out because we want them in our reach. 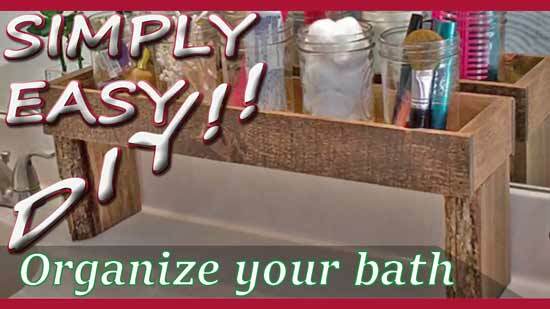 This attractive DIY organization unit, is a great way to keep everything in it's place. Beginning DIY'ers will love this build. Minimal experience needed along with supplies and time. Intimidated about building the pine box on your own? Not to worry. You can visit www.walnuthollowcrafts.com to purchase their rustic wood ledge which they have for sale.